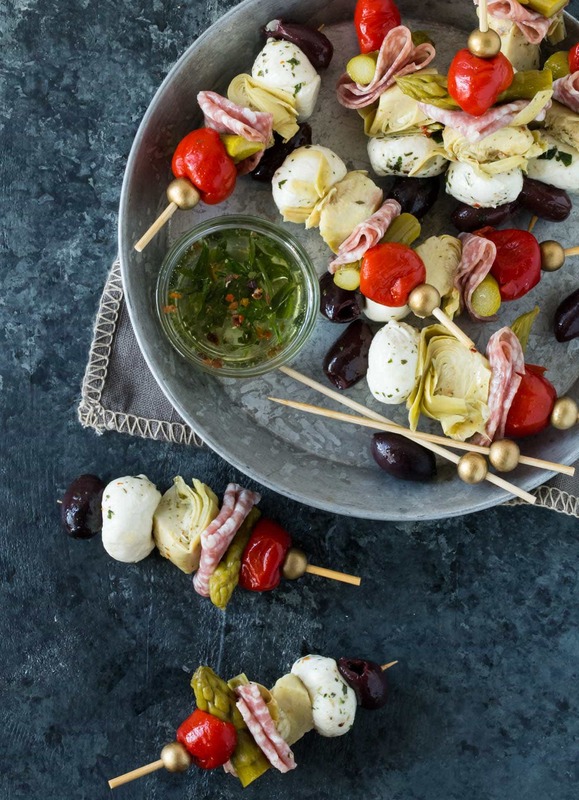 Appetizers don’t get much easier than these Antipasto Skewers. They are so packed with flavor, it’s like a party with each bite. Make-ahead and super easy. That’s the name of the game with these Antipasto Skewers. The hardest part about them is deciding what order all the ingredients go on your cute little skewers. Lucky for you, I took it upon myself to do the heavy lifting for you. I started with some small piquant peppers for a little heat, followed by pickled asparagus and then a bit of salami for a little salty flavor. After that came the marinated artichoke hearts, marinated mozzarella and – the finishing touch – kalamata olives. For an extra flavor boost, I drizzle the top of the finished skewers with some of the reserved marinade from the mozzarella balls right before serving. Is your mouth watering yet? If it isn’t, I’m not sure we can be friends, because these little skewers of goodness are pretty much perfection on a stick. 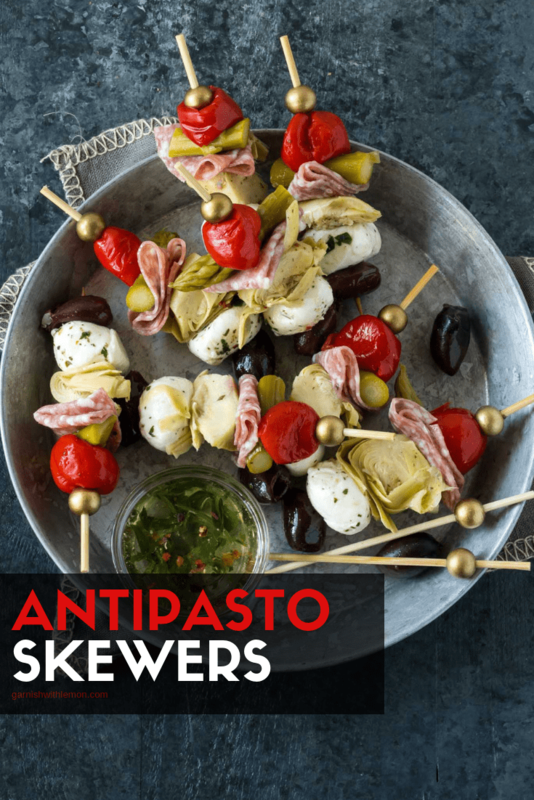 And with literally no prep work other than shopping for ingredients and draining, these make-ahead Antipasto Skewers are one of my new faves. Once you try them and see how quickly they disappear when you serve them, you will wonder where these have been your whole adult life. At least I did and now they have earned a permanent spot in my go-to appetizer collection. 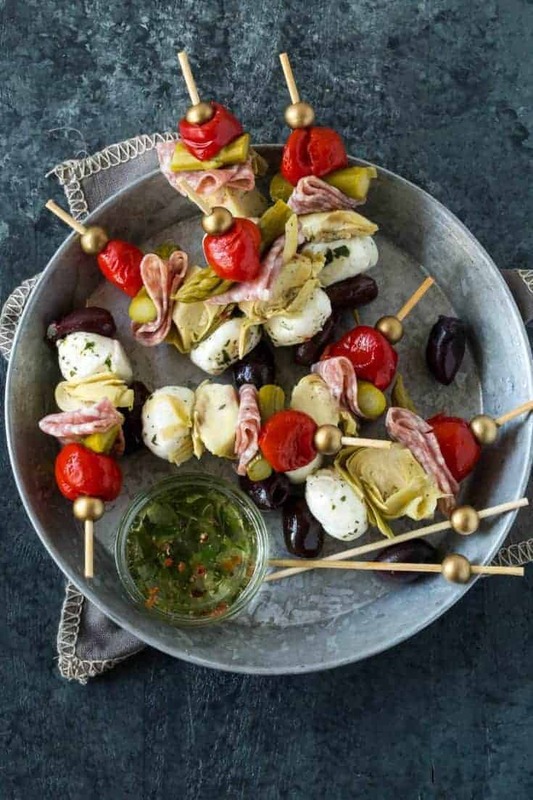 Tip: These Antipasto Skewers are super easy to make in whatever quantity desired. Make a few for a small happy hour or a large batch for a party. Appetizers don't get much easier than these make-ahead Antipasto Skewers. Thread peppadews and pickled asparagus onto a skewer. Fold salami in half and then half again before threading onto the skewer. Add a marinated artichoke heart, mozzarella ball and kalamata olive. Repeat. Cover tightly and refrigerate until ready to serve. If desired, serve with a small of the reserved mozzarella marinade for dipping. Yes, please! I absolutely love everything about this. delicious! what’s in the little bowl? It’s some of the marinade from the marinated mozzarella balls!